§1.1. MDP 17, 112, like most proto-Elamite tablets, was first published in the early part of the twentieth century when understanding of both the writing system and the society that produced it were still relatively poor. Recent advances in the study of early Iran and the proto-Elamite writing system in particular have prompted a re-evaluation of the corpus (Englund 2004; Dahl 2013). §1.2. The very difficult text was published first by V. Scheil in 1923. The present article is based on a new collation (Musée du Louvre, July 2011) that corrected several errors and helped illuminate the overall structure of the text. MDP 17, 112, is a small clay tablet from Susa, inscribed on both its obverse and reverse in the proto-Elamite script. Dating of proto-Elamite tablets is problematic; however, based on certain criteria established for determining the relative chronology of proto-Elamite texts (such as the thickness of the tablet, the format of the text, and the sign forms), it is likely a relatively late text (Dahl et al. 2013). MDP 17, 112, is an administrative document—with two exceptions the only genre identified in the proto-Elamite corpus thus far—and most likely records a roster or inventory of dependent workers belonging to a particular household or institution. 1c. M72 , 1N1 (and) 1 dependent female worker. 2a. M72 , 2N1 2 dependent female workers. 3b. M54 , 2N2 (and) 2 M54. 4b. M54 , 2N2 (and) 2 M54. 5c. M72 , 1N1 (and) 1 dependent female worker. 7e. M72 , 1N1 (and) 1 dependent female worker. 8c. M46 , 1N1 (and) 1 M46. 9b. M54 , 1N1 (and) 1 M54. 10b. M3b , / 1N1 (and) 1 M3b. 10d. M72 , 1N1 1 dependent female worker. 11b. M3b , 1N1 (and) 1 M3b. 12b. M72 , 1N1 (and) 1 dependent female worker. 13a. M317 , 1N1 1 M317. 14c. M72 , 1N1 (and) 1 dependent female worker. 5. M46 , 1N1 (and) 1 young dependent worker. Note that these images reflect the tablet being rotated around its long, vertical axis, not its shorter, horizontal axis. §3.1.1. Most proto-Elamite tablets begin with a sign that acts as a header for the entire text, and MDP 17, 112, is no exception. Headers are single and, often, complex graphemes that may represent the individual, household, or institution to which the document or entities recorded belong (Englund and Damerow 1989: 13). These signs correspond to similar information recorded at the end of some proto-cuneiform texts (Englund 2004: 106 n. 12). §3.1.2. The header in MDP 17, 112, is M327+M342, which corresponds to sign M327a in Meriggi’s sign list (1974). This sign occurs in at least 35 published proto-Elamite texts (including MDP 17, 112). It is the header in all of these texts except for MDP 17, 132, and MDP 17, 146, in which it occurs in the body of the texts and appears to be modifying an entry that is being counted. §3.1.3. Only four tablets containing the header M327+M342 are sealed, and they do not all bear the same seal. The seals associated with M327+M342 are: PES 198 (MDP 6, 233), PES 103 (MDP 17, 489), and an unidentified seal (MDP 17, 50; MDP 26, 52) (Legrain 1921; Scheil 1935; Amiet 1986). §3.2.1. The main entries in this text start on the obverse and continue onto the reverse, rotating the tablet on its vertical axis. MDP 17, 112, is a complex text compared to the standard proto-Elamite corpus because each entry in this text contains at least one, and sometimes several, sub-entries. Each main entry consists of a long string of non-numerical signs that can be analyzed as consisting of signs from two distinct sub-groups of the signary: owner signs and signs for which a syllabic value has been suggested (Englund 2004: 127; Dahl 2013). Almost all of the owner designations mentioned here occur in other proto-Elamite texts, indicating that they might indeed be standard professions or titles that are common among the proto-Elamite households or institutions that used this writing system. §3.2.2. Many of the sub-entries do not occur in any other proto-Elamite text, which would be unusual if they represented positions or titles. Instead, based on the structure of the strings of signs there is a high likelihood these are syllabically written words or names, which could either designate the individual who fills the position or title preceding the personal name, or indicate an individual who is responsible to the individual holding the position or title preceding the personal name. §3.3.1. Most proto-Elamite texts contain a total of all account entries. This total is always written on the reverse of the tablet, rotated around its vertical axis (Englund 1996: 161). Proto-Elamite totals can be comprehensive and complex, with each product individually totaled, or they can be simplified totals in which some of the entries being counted on the obverse are subsumed into another group of counted entities on the reverse. §3.3.2. As expected, MDP 17, 112, ends with a total on the reverse of the tablet. In the main body of the text, there are seven groups of entries on the obverse and seven on the reverse. 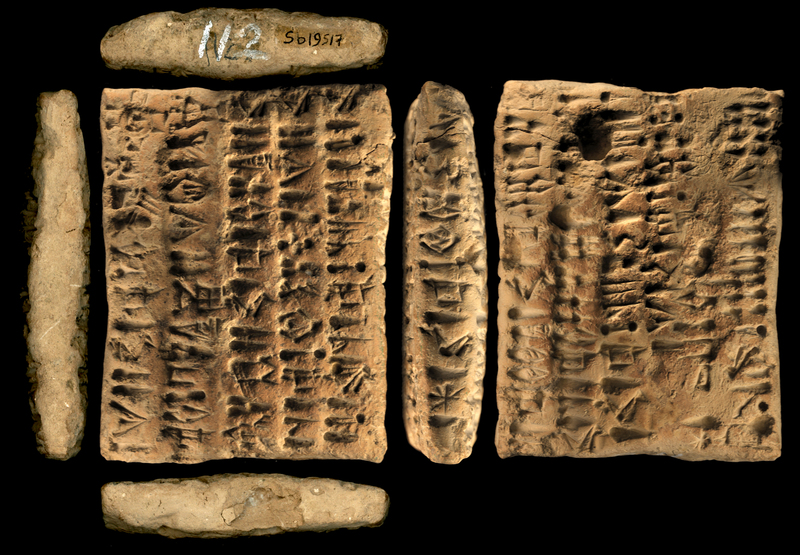 The total on the reverse of this tablet draws attention to a common feature of the proto-Elamite writing system: the sub-grouping of certain signs as other signs in the totals of the texts. The total on the reverse only contains five entries: M317, 1N14 2N1; M54, 1N14 7N1; M373, 3N1; M72, 9N1; M46, 1N1. Therefore only five items (or groups of items) are being totaled. This suggests that some of the items counted in the main body of the text are being grouped with other entries and therefore totaled under a different sign in the summary. All the entries and numbers in the total of the text correspond to the numbers of the entries in the main body of the text except for M54. There are seventeen M54 in the total but only thirteen in the main body of the text. However, there are four M3b in the main body of the text that are not accounted for in the total. If one counts these towards the M54 total then the numbers add up and there are no numerical entries in the main body of the text that are unaccounted for in the summary, and vice versa. Since M3b is subsumed under M54 in the summary we can conclude that these two signs are likely to be semantically related. MDP 17, 112, is a typical proto-Elamite text in many ways. It begins with a header, ends with a total, and contains a number of entries and sub-entries that include numerical notations. There are, however, several features of this text that make it unusual and that are worth noting. These include the use of the numerical notation N2 (which in this text count the objects or individuals being represented by the sign M54), the presence of a scribal error, and the inclusion of a postscript. §4.1.1. N2 occurs in both proto-Elamite and proto-cuneiform. In the proto-cuneiform corpus, this sign belongs to the derived sexagesimal System S' and has the numerical value of “1.” A quick look at the proto-cuneiform corpus informs us that the System S' was used in a limited number of contexts: lexical lists concerning animals (W 20266,55), fish (W 21916,2; W 14777,b; W 21208,49), geography (W 21208,50), general vocabulary (W 14337,a+), and one lexical list of undetermined type (W 20266,175); texts concerning liquids (Nissen et al. 1993: 28), particularly beer and beer products; animal husbandry texts; texts possibly concerning foodstuffs; and a few texts of unknown content. §4.1.2. The precise meaning and function of N2 in proto-cuneiform is not known. 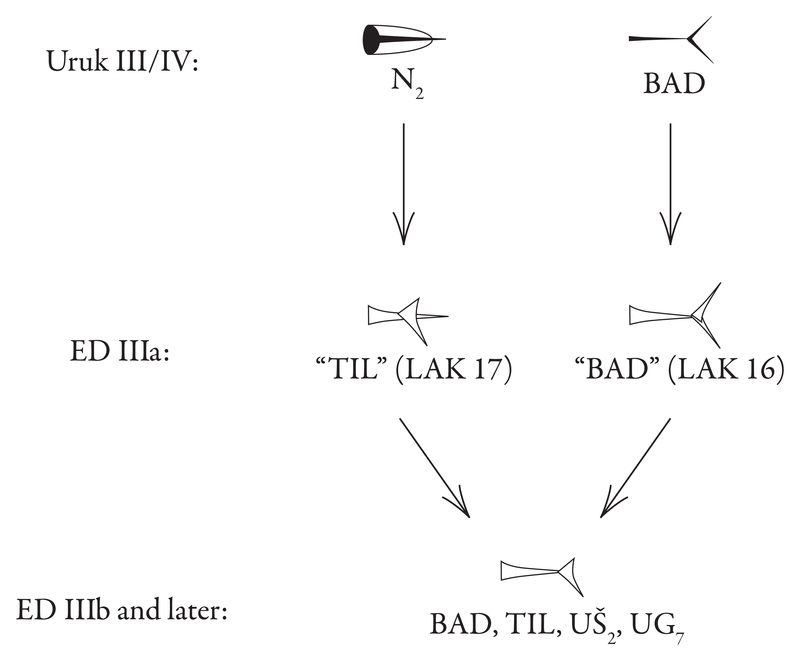 It has been suggested that N2 in proto-cuneiform is the precursor to the sign BAD, with the later readings uš2/ug7 attested in the Ur III and Old Akkadian periods (Damerow and Englund forthcoming), including at Ebla (Butz 1981: 338), and in these later texts it is clear that it bears the meaning “sacrificed,” or in the case of humans, simply “dead.” In order to evaluate whether or not N2 could mean “dead” or “sacrificed” in the proto-cuneiform texts as well, we must look to the animal husbandry texts; the precise meaning “dead” or “sacrificed” cannot realistically be applied to lexical lists, foodstuffs, or beer products. Even in these texts, the function of N2 is not obvious. Therefore the evidence we have to connect N2 with “dead” animals is suspect. It comes from texts that are 1000 years younger than the proto-cuneiform texts, and from a proposed connection between N2 and later BAD. 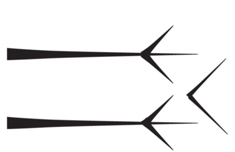 The proposed sign evolution that lead the trend to associate N2 with BAD—and therefore with the meaning “dead”—is diagrammed below. §4.1.4. Even if N2 is used to denote dead or sacrificed animals in the Uruk corpora, the evidence for this is weak and the texts themselves are inconclusive. It is more likely that N2 in proto-cuneiform denotes the entities it counts as “other” or “special.” The meaning “dead” may then have been later attributed to it due to the confluence of the N2/“TIL” and “BAD” signs. §4.2.1. In MDP 17, 112, N2 is used to count M54 in four different entries (lines 1b, 3b, 4b, and 5b), and in each occurrence two N2’s are listed (in other entries, however, M54 is counted with N1). Based on the total on the reverse, each of these N2’s must be equal in value to the sign N1 in order for the total to equate the entries on the obverse. When totals are present on the reverse of tablets, N2’s are always counted towards the summed totals (versus being subtracted from them) and objects counted with N2 are never totaled separately from the same objects being counted by N1. Therefore there is no total in the proto-Elamite corpus that includes the sign N2. Every sign listed above most likely represents some kind of dependent worker (except M346, if that is indeed what is being counted in MDP 17, 350). Therefore it appears that N2 is used exclusively, or almost exclusively, to count various types of dependent workers – as opposed products, commodities, or animals as in the proto-cuneiform corpus. If this is true, then proto-Elamite N2 and proto-cuneiform N2 have nothing in common apart from their graphical similarity. Figure 3: The Early Convergence of N2 and BAD. §4.2.4. In addition to acting as a numerical sign, N2 also has a non-numerical value (transliterated as M386a); such polyvalence is not uncommon in proto-Elamite (Englund 2004: 113). M386a is classified as one of the 80-120 signs that are likely to carry a syllabic value. It occurs as a non-numerical sign in over 50 texts. §4.2.5. As is illustrated above, the precise meaning and function of the sign N2 in the proto-Elamite corpus is also not entirely understood. Similar to the proto-cuneiform corpus, N2 carries a numerical value in proto-Elamite and is a graphical variant of N1 with the addition of a single vertical stroke inside the body of the sign. It seems to carry the same numerical value as N1, which represents one unit in both the decimal and sexagesimal numerical and metrological systems. Proto-Elamite N2 on the other hand only exists in the decimal system. It is possible that proto-Elamite N2 is a borrowing from proto-cuneiform, like most other proto-Elamite numerical signs were, and we could therefore look to proto-cuneiform to help deduce how N2 was being used in proto-Elamite. There are several problems with this, however. The first is that the rest of the proto-cuneiform System S' (N15 and N35) is not attested in proto-Elamite. Second, as was already mentioned above, N2 in proto-Elamite only operates in the decimal system so far as is attested, while N2 in proto-cuneiform operates in the sexagesimal system. Third, the function of N2 and the rest of the System S' in proto-cuneiform is not well established, as was illustrated above. Last, the types of entities being counted with N2 in proto-cuneiform (animals, beer jars, foodstuffs, and lexical entries) are incongruent with what N2 is being used to count in the proto-Elamite corpus (dependent workers). §4.2.6. There is another explanation, however. Derived signs are common in the proto-Elamite script, and can be made by modifying basic signs by the addition of single wedges, dots, lines surrounding the sign, dots surrounding the sign, small wedge-like impressions surrounding the sign, or by other means. The derived signs most likely represent semantic or phonological variants on the original sign. Their prevalence in the writing system indicates that we should not assume that proto-Elamite N2 was necessarily a direct borrowing from proto-cuneiform. I suggest that proto-Elamite N2 was an independent development derived from proto-Elamite N1 (which, along with the other basic numerical signs, was a direct borrowing from proto-cuneiform). Regardless of whether or not it was an independent development in proto-cuneiform and proto-Elamite, it is clear that N2 was used to designate whatever it was used to count as “other,” or distinct from the usual or majority object being counted. In the case of proto-Elamite this could possibly indicate a difference in gender, in worker status, or in type or amount of rations to be received. In proto-cuneiform, perhaps N2 indicated that a different type of grain was used to make the beer or different additives were infused into the beer in the case of beer texts, that certain animals were already designated for a certain purpose or function in the case of animal husbandry texts, and similar designations in lexical lists. §4.3.1. The addition of one M72 in the bottom margin of the obverse (in line 6e of the transliteration, actually in the middle of group 7), which Scheil mentions in his initial publication of the text (1923: 16) can only be interpreted as an emendation to the previous group of entries. Since this tablet maintains a fixed order of counted entities in each entry, we can ascertain that M72 was written directly below the position in which it should have been written if it had been originally included in the chain of entries for group 6; that is, as the last entry in the sequence. §4.3.2. Scribal errors of this sort are very rare in the proto-cuneiform record. This text therefore provides a rare example of such a situation, and from it we can conclude that one method of correcting scribal errors—at least in the proto-Elamite writing system—is to insert the missing sign(s) in the lower margins of a line, directly beneath where the entry should have been written in the first place. §4.3.3. Scribal errors occur more commonly in the proto-Elamite corpus than in the proto-cuneiform corpus (for examples of errors in proto-cuneiform, see Nissen, Damerow, and Englund 1993: 42), especially as arithmetical incongruities between the entries and the total. For example, if we look at MDP 6, 361, we can see that there are three entries counting M376 (in the second entry M376 must be implied even though it is not expressly written) on the obverse totaling 39 units; on the reverse, the total was originally written as being 59 units of M376. At least one of the N14’s appears to be erased, but there is still one more than we would expect to find based on the entries on the obverse, which leaves the apparent total at 49 units. §4.4.1. The presence of postscripts (also called subscripts in other publications, see Dahl 2012; 2013) in the proto-Elamite corpus is rare, found in only about 100 out of over 1500 published proto-Elamite texts. Postscripts range from a single sign to a string of six signs, and it is still unclear what information they contain, what purpose they serve, and why some texts include them and others do not. The postscript in MDP 17, 112, is written after the total and consists of the following four signs: M139? M32 M387 M218. This combination of signs does not occur in any other published proto-Elamite tablet, either as a postscript or otherwise. §4.4.2. 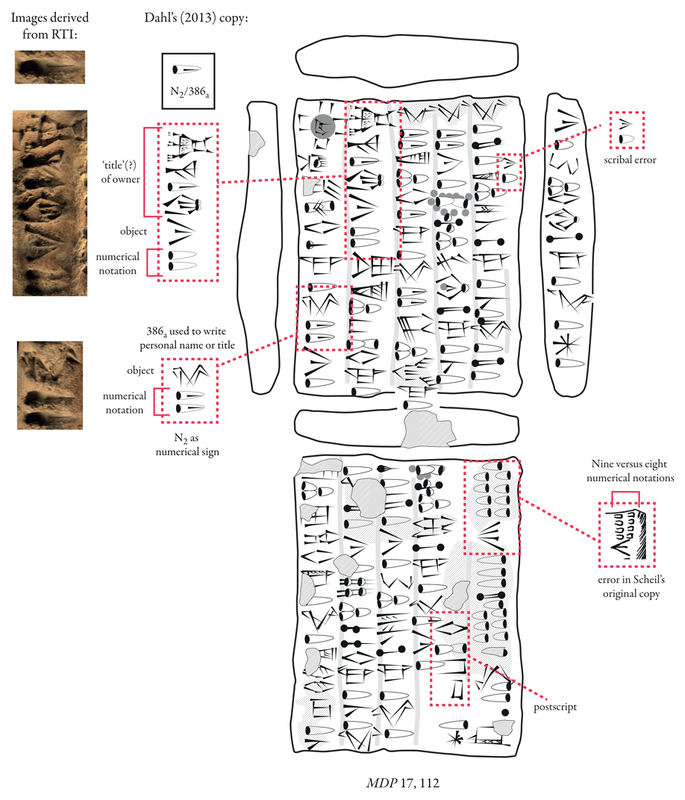 Although at this stage in the decipherment it is not possible to explain the presence of postscripts on certain Proto-Elamite tablets, preliminary investigations suggest that there may be a relationship between the postscript on a tablet and the header. Otherwise, there does not appear to be any relationship between postscripts and the presence or type of seal on the tablet, the entities being recorded, or other such markers. Due to the wide number of different postscripts, it is unlikely that they all represent a calendrical date, though they could reference festivals or other events. Another possibility is that they are a syllabic or pseudo-syllabic rendering of the name of the scribe who wrote the tablet. 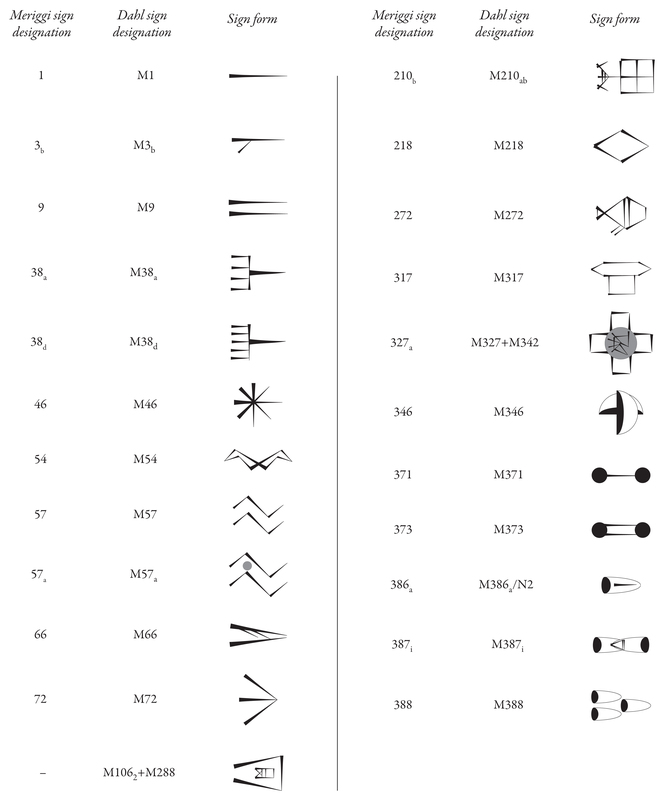 In many ways the text MDP 17, 112, is typical of the proto-Elamite corpus; however, it also illustrates a number of peculiarities of the proto-Elamite writing system (see figure 4), such as the use of the numerical value N2, how proto-Elamite scribes accommodated a scribal error, and the presence of a postscript (illustrated in figure 4). While further research is necessary to fully understand how these features operate in the proto-Elamite writing system, I hope this article has demonstrated that these are indeed interesting aspects of the writing system that do warrant future study. 1986 L’âge des échanges inter-iraniens 3500-1700 avant J.-C. Editions de la Réunion des musées nationaux. Paris: Ministère de la culture et de la communication. 1981 “Zur Terminologie der Viehwirtschaft in den Texten aus Ebla.” In Luigi Cagni., ed., La lingua di Ebla. Naples: Istituto Universitario Orientale, pp. 321-353. 2013 “Early Writing in Iran.” In Potts, D. T., ed., Oxford Handbook of Iranian Archaeology. Oxford: Oxford University Press, pp. 233-262. Dahl, Jacob L., Petrie, Cameron A. 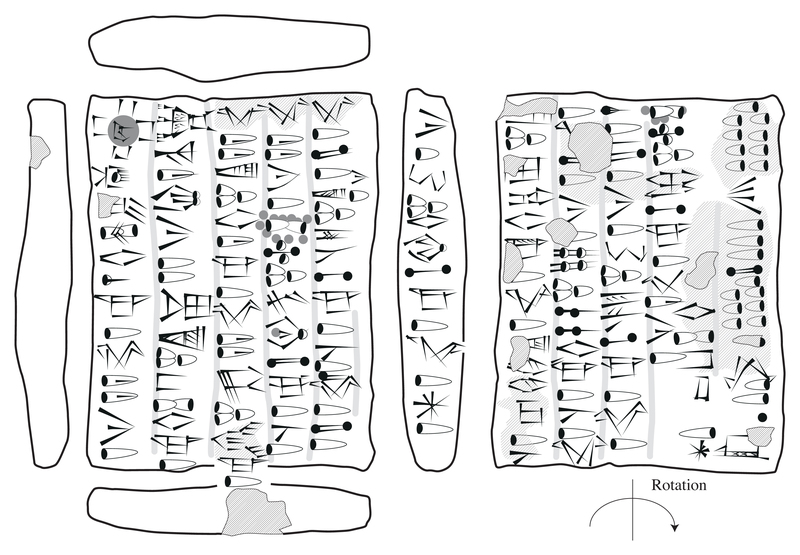 2013 “Chronological Parameters of the Earliest Writing System in Iran.” In Cameron A. Petrie, ed., Ancient Iran and Its Neighbours: Local Developments and Long-range Interactions in the 4th Millennium BC. Oxford: Oxbow Books. pp. 353-378. 1989 The Proto-Elamite Texts from Tepe Yahya. American School of Prehistoric Research Bulletin 39. Cambridge, Mass. : Harvard University Press. forthcoming The Proto-Cuneiform Texts from the Erlenmeyer Collection. & William Bright, eds., The World’s Writing Systems. Oxford: Oxford University Press, pp. 160-164. 2004 “The state of decipherment of proto-Elamite.” In Stephen D. Houston, ed., The First Writing: Script Invention as History and Process. Cambridge: Cambridge University Press, pp. 100-149. 1980 “Animal Husbandry at Uruk in the Archaic Period.” JNES 39, 1-39. 1921 Empreintes de cachets élamites. MDP 16. Paris: Ernest Leroux. 1974 La scrittura proto-elamica. Parte IIa: Catalogo dei segni. Rome: Accademia Nazionale dei Lincei. 1993 Archaic Bookkeeping: Early Writing and Techniques of Economic Administration in the Ancient Near East. Chicago: University of Chicago Press. 1905 Documents archaïques en écriture proto-élamite. MDP 6. Paris: Ernest Leroux. 1923 Textes de compatibilité proto-élamites. MDP 17. Paris: Ernest Leroux. 1935 Textes de compatibilité. MDP 26. Paris: Ernest Leroux.